As costs continue to rise, healthcare policymakers are balancing a mandate by their constituents to make the system more efficient and accessible, all while maintaining safe, high-quality service delivery. Research suggests a CRNA-based anesthesia care model moves lawmakers a step closer to meeting that challenge. CRNAs help to bend the healthcare cost curve and save the state of Oklahoma millions of medicare dollars. 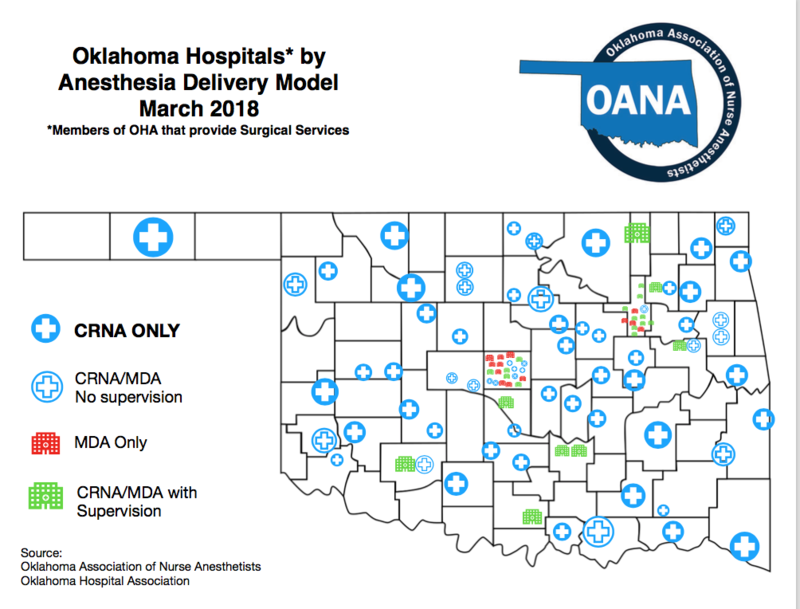 CRNAs are the main anesthesia providers to the majority of communities across Oklahoma. Without CRNAs vital surgical and obstetrical services would not be available to the citizens of Oklahoma. 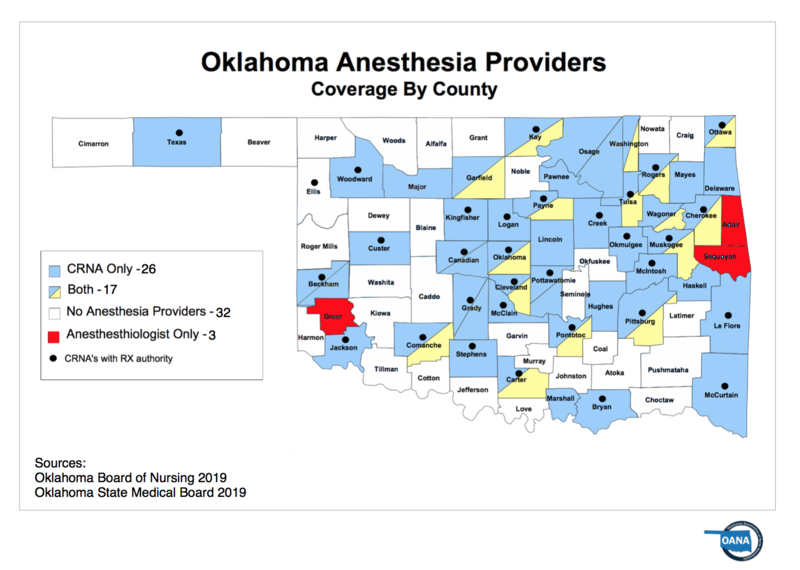 The majority of CRNAs throughout Oklahoma are not supervised by Anesthesiologists. Instead this outdated supervision requirement is being met by Dentists, Podiatrists, Hospitalists, and Surgeons. CRNAs work in a collaborative relationship with these other providers to bring much needed services to Oklahoma communities. Next time someone suggests to you that a CRNA needs to be supervised, ask them for truth about who is truly doing the supervision. CRNAs are the anesthesia experts who these providers count on to SAFELY administer anesthesia throughout our state EVERYDAY. The practice of anesthesia has an exemplary safety record whether provided by a CRNA working alone, an anesthesiologist working alone or a CRNA working with an anesthesiologist. In either scenario, deaths attributed to anesthesia during surgery are extremely rare, occurring approximately once in every 250,000-300,000 anesthetics provided. A 2010 study found the most cost-effective anesthesia delivery model is a CRNA working as the sole anesthesia provider. Another landmark study confirmed there are no measurable differences in the quality or safety of anesthesia services delivered by CRNAs, anesthesiologists, or CRNAs supervised by anesthesiologists. Long before either of these studies were published, a 2001 federal rule allowed states to opt out of (be exempt from) the Centers for Medicare & Medicaid Services (CMS) requirement that CRNAs must be supervised by a physician for their facility to be reimbursed. To date, 17 states have opted out. 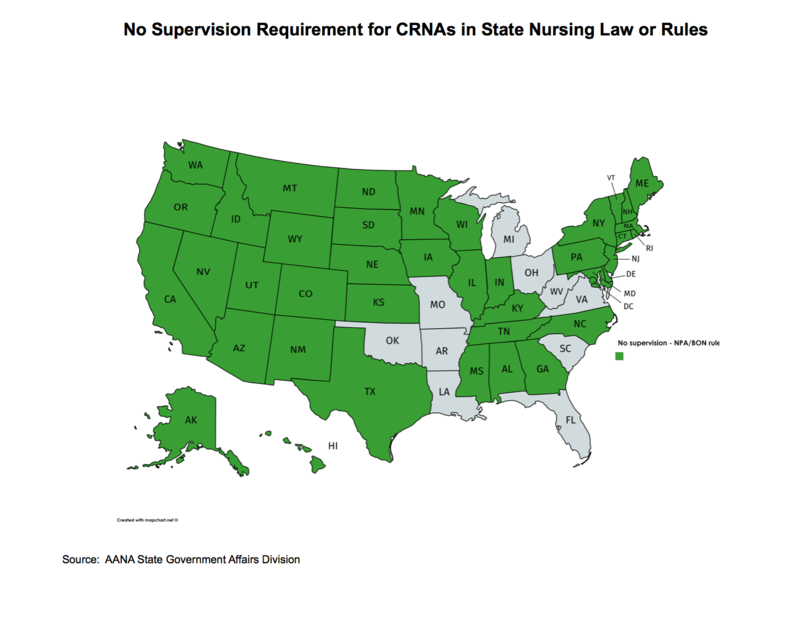 Whether or not a state has opted out, CRNAs are not required to be supervised by physician anesthesiologists. To promote patient access to safe, high-quality, cost-effective healthcare, the American Association of Nurse Anesthetists (AANA) has called for Medicare to eliminate the unnecessary CRNA supervision requirement and allow states and healthcare facilities to make their own decisions about how to best staff anesthesia departments based on state laws and patient needs. By making this change, Medicare can align national policy with state scopes of practice, promote healthcare delivery consistent with patient and community needs, and open the door for cost savings associated with delivery system innovation. This approach also is consistent with recent recommendations from the Institute of Medicine. Given that CRNAs are highly educated, advanced practice registered nurses who consistently deliver anesthesia to patients using the same procedures as physician anesthesiologists, allowing these professionals to practice to their full scope just makes sense.